Sunday, May 22nd, we gathered in Kitty and David's kitchen/dining room to watch Carole and David open presents. Coffeecake, coffee and juice was served. 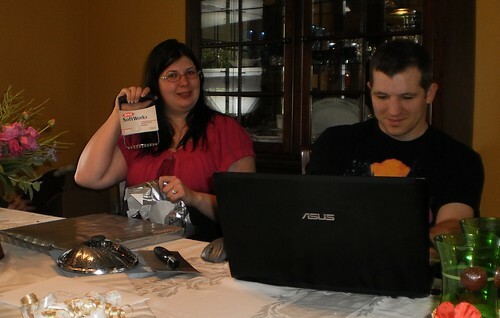 Carole did the opening and David typed the name and the gift into the computer list. Taking stock this way meant no tags were lost so when they get back to Connecticut they don't say, "Who gave us the widget?" Here, she holds up the potato masher a friend of mine gave her. When this was all done, people took their leave. The wedding was officially over. Mom and I waited until the very end. We actually had another engagement so being last to leave wasn't a bad thing for us. This is what you work toward when you have children. You hope that you've raised them to be competent humans, self-sufficient, and that they will find someone who compliments them. Hugging my daughter goodbye was the one time I started tearing up. I'll always be "mom" but it's not in the fashion it was before. This is a good thing. One phase of life has ended and another has started. Mom and I headed off to the Borders in Warrenton. I didn't want to go back the way we had come so I bought a road atlas and planned a different journey back to April and Perry's, one that would take us through some mountains and, hopefully, some scenery. Before we set out, however, there were friends to meet. Two of my World of Warcraft guild mates live in the Washington DC area. We arranged to meet them at Red, Hot and Blue in Warrenton. 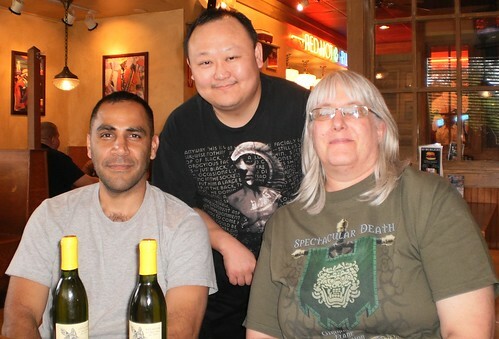 Javier, Doo and I talked WOW and life and all sorts of things for about 90 minutes before parting. This is what I love about the people in my guild in this fake world. We have the chance to meet each other, face-to-face and we took it. You can put a face now to the pixels running around on the screen. Javier and Doo are great guys and I am so pleased to have gotten to know them through an online game and to call them friends. I had met Doo before when he came to Chicago and it was nice to see him again. This was the first time I'd met Javier. With hugs and "take care of yourself", mom and I were off on the next to last leg of our journey.